Drones a.k.a. unmanned aerial vehicles were once considered as military airships. It is a known fact that larger aircrafts can be controlled from larger distances. There are few drones that are very famous to deliver weapons in most efficient manner causing no harm to the humans involved. However, these drones are now developed and marketed cheaply for commercial purposes. 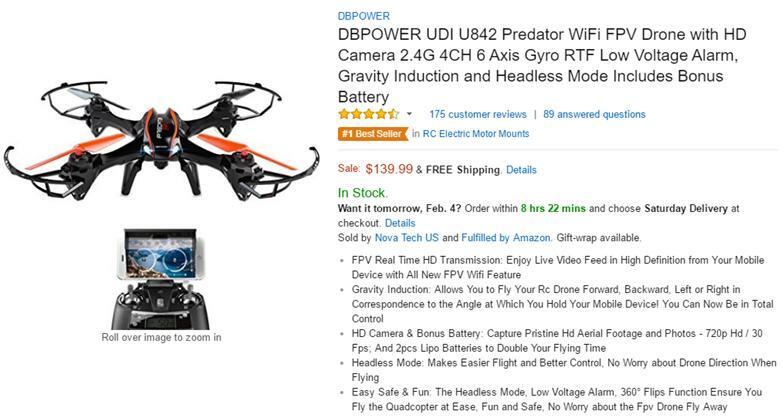 For example a “Predator WiFi FPV Drone with HD Camera 2.4G” is available on Amazon® for just $139.99. In contrast to the benefit of a drone, its easy availability allows people with ill intentions to ruin someone’s privacy without permission or without getting noticed. Source: https://www.amazon.com/The primary goal of this article is to illustrate a few techniques which restrict drones from entering prohibited areas, so that one’s privacy shall be maintained from rouge drones and also priority areas such as home of president, parliament, airports etc can be protected from the drones that are not authorized to perform surveillance. One of the easiest ways to capture a drone is practiced by Tokyo’s Metropolitan Police Department (MPD) to watch over the prime minister’s office, and other high profile locations. 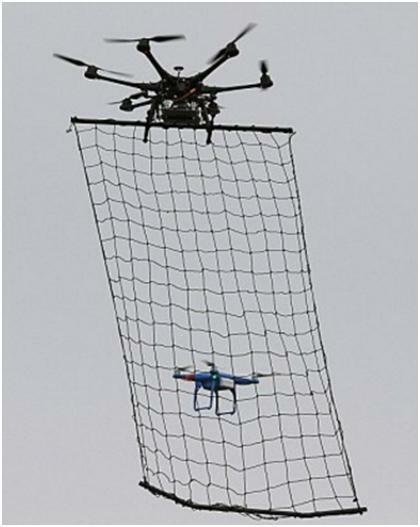 They use drones with nets to trap suspicious drones. The smaller copters are easily brought down out of action as their propellers caught in the net’s mesh. An image taken from the demonstrated videoIt is observed that very few patents are filed in this domain. Most of them either talk about jamming the drone signals or overpowering a particular drone. A United States patent (# 9,529,360) discloses a method for detecting and defeating drone by capturing the control signal and overriding them by neutralizing the unmanned aerial vehicle. Furthermore, a security researcher, Rahul Sasi has developed what he claims to be the world’s first drone malware which he referred as Maldrone. He tested his malware on the AR Drone manufactured by Parrot, a Linux powered drone that can be driven by users with their smartphones or tablet over WiFi. The malware shuts off the drone’s autopilot system, causing it to drop out of the sky like a stone. A business entity named Blighter Surveillance Systems provides products/systems which restricts/disables a drone to enter into the sky of a private property such as AUDS (Anti-UAV Defense System), A400 series air security radars, etc; and Chess Dynamics’ Hawkeye Deployable Systems are among the few. These are designed to detect, disturb and deactivate unmanned aerial vehicles (UAVs), and remotely piloted aircraft systems (RPAS) engaged in hostile airborne surveillance and potentially malicious activity. Similarly, there is another manufacturer called Drone Shield who provides various solutions to counter rouge drones. The most interesting is the “DroneShield On-Site Processor” that collects audio data from DroneShield sensors and matches it to a set of preloaded acoustic signatures in the database even in the absence of an internet connection. When the signatures match, then the processor issues immediate alerts via SMS, email, or alarm systems. Market research shows that by 2022, the anti-drone revenue may reach USD 1.14 Billion at a CAGR of 23.89% from 2017 to 2022. The market growth is based on varied parameters such as large number of security breaches by the anonymous drones and a steep rise in the terrorist and illegal activities in the recent days. At the end of the day, defending a drone by just shooting at them by a rifle is not always the solution. This fact leads to the development of advanced drone neutralizing/capturing equipments such as drone guns or drone deactivators, so one can point the weapon towards the drone and bring it down. 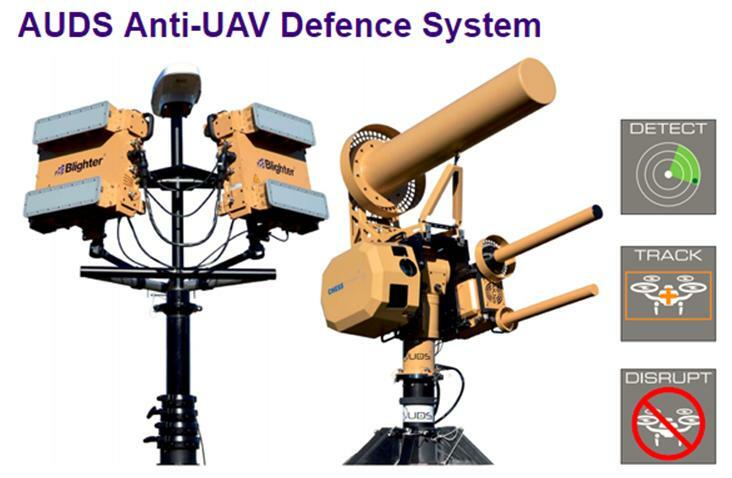 Other techniques such as unique RADARs, Wi-Fi disablement, malicious codes or hijacking can also be used as Anti-drone systems. It looks like the field of anti-drone systems is slowly escalating, to deal with the possible security threats looming around.